Enveloped, spherical, about 50 nm in diameter. 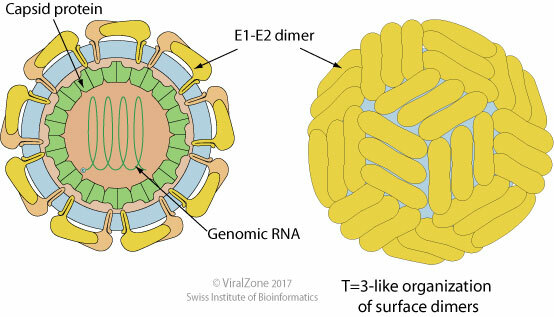 Mature virions contain two virus-encoded membrane proteins (E1 and E2) in addition to the capsid protein. Monopartite, linear, ssRNA(+) genome of about 10 kb. The genome 3' terminus is not polyadenylated but forms a loop structure. There is an internal ribosome entry site (IRES) at the 5' end that mediates translation initiation. The virion RNA is infectious and serves as both the genome and the viral messenger RNA. The whole genome is translated in a polyprotein, which is processed co- and post-translationally by host and viral proteases. Attachement of the viral envelope protein E to host receptors mediates internalization into the host cell by clathrin-mediated endocytosis. Replication takes place at the surface of endoplasmic reticulum in cytoplasmic viral factories. A dsRNA genome is synthesized from the genomic ssRNA(+). Host miRNA mir-122 plays a essential role in initiating replication. Virus assembly occurs at the endoplasmic reticulum and seems to be facilitated by the viral ionic channel p7. The virion buds at the endoplasmic reticulum and is transported to the Golgi apparatus. Hepatitis C virus inhibits the interferon signaling pathway by blocking the IFN receptors , STAT1 and TYK2 . Hepatitis C virus inhibits the host IFN-mediated response by blocking host MAVS , TRAFs and TBK1-IKBKE-DDX3 complex .